A search on Google for passive investing vs active investing yields 1,330,000 results with plenty of support on both sides of the fence. In brief passive investing is a method where you buy an investment product that simply tracks an index. They are commonly called index trackers and with this method you expect to do no better than the index it is tracking after expenses. In contrast active investing is a method where you pay a financial professional higher expenses than those of a passive tracker and in exchange he or she is supposed to beat an index s/he is measured against. Beating the index is the critical point as research I’ve quoted before shows that somebody entrusting their money to a UK financial advisor or investment manager will be paying an average 2.56% annually for financial planning services and financial product expenses. Let’s demonstrate the effect these expenses can wreak with a simple example knowing that UK equities have ‘only’ returned a real 5.0% over the last 116 years. Passive Punter self invests £10,000 into a UK Equity Passive Fund which sees expenses of 0.25% and then promptly forgets about it for 20 years. Assuming that fund returns a real annualised 5.0% before expenses over that period our Passive Punter ends up with a real £25,298. So far so good. Step forward our Active Punter, again with £10,000, but instead this time entrusts those savings to a financial planner who invests it all into a UK Equity Active Fund. S/he sees those average annual expenses of 2.56%. Assuming that they then only match the market return of 5.0% our Active Punter only ends up with a real £16,195. That is a huge difference. This brief experiment demonstrates that for Active to work out performance against the index is essential. 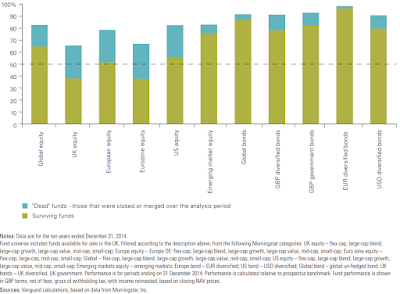 So just how many funds outperform? This is where some research from Vanguard (who of course have a vested interest but do use data from Morningstar which is hopefully impartial) that I recently stumbled across might prove useful. Figure 9 is the critical one. 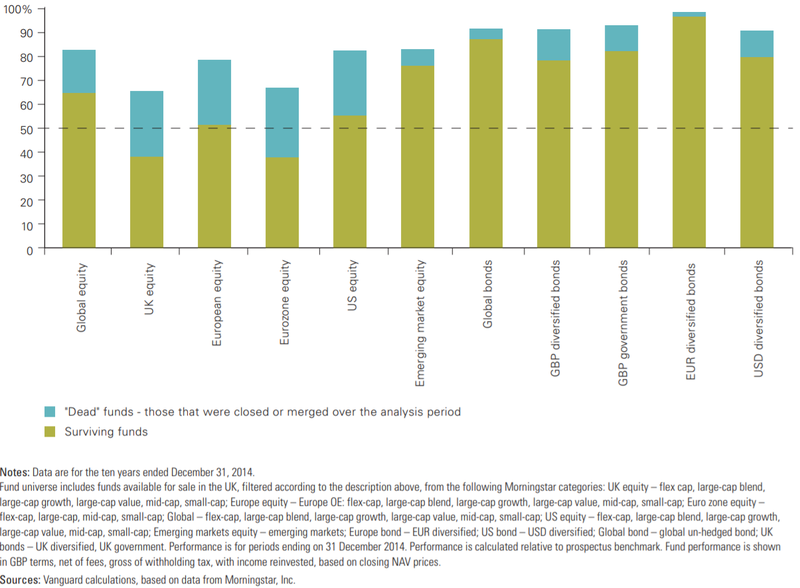 I wouldn’t back myself to find the circa 35% of active funds that beat low cost passive UK equity funds or the circa 20% of active funds that beat passive global equities funds or the circa 5% of active funds that beat passive GBP government bond funds. I’ll therefore stay DIY plus passive and so continue to pay 0.22% in both wrapper (ISA, SIPP, Trading Accounts) plus fund expenses annually. The question then becomes do you back your financial planner or yourself to find those out performing active funds over the very long term? I would work with a planner if I could find one who was willing to share some risk and be paid by performance as opposed to a fixed percent fee regardless of performance. Not too many planners do that so I can only assume they would not be any better at consistently picking out-performing funds than I would. I read quite widely on the topic of personal finance and I've never heard of a planner who aligns their own remuneration with that of their clients. Do they actually exist? Maybe a new type of financial adviser will arise based on Taleb Nassim's concept of 'Skin in the game' - who will demonstrate his integrity by 'sharing the pain'. Hmm ... I'm not holding my breath for that! There is little incentive for the adviser to offer this structure as the income instability could wreak havoc on their business. Also if there are large numbers of clients willing to pay a flat fee, why bother with the headache? A financial adviser / planner will be doing a lot more than selecting funds to invest in - and managing those investments thereafter. So you end up paying something for his training , knowledge , skill and expertise . You (RIT) may not need to have explained to you some advantages of investing in ISA's ( even though you may never pay CGT ), investing in Pensions and why you may choose a SIPP, why it might be worth transferring some assets to your spouse , how to write a will to reduce IHT bill etc etc. But for most of " us " some of these things will ne valuable , money saving and worth paying something for. RIT - you are very keen on the " zero sum game " - and that subject has been discussed at length on your blog - but there is a zero cost game that you play - or at least you think it is zero cost . Your ability to research / understand / check out and question financially related subjects has been demonstrated over the years in many of your posts - if not nearly all of them . I for one could not afford the time that you spend - and it would undoubtedly take me a lot longer to find out about and understand the issues that you cover. It would eat into my life and cause me anxiety . That's one of the reasons I like your blog - you often have done all the work for me ! I know that you get a lot more from your blog - by sharing and getting feedback hopefully in the same way that you are helping me ( and I am sure many others ) you get something in return . I suspect you must value that in some way - otherwise you would dtop spending the time doing it. I agree that a financial planner can offer far more than just which funds to invest in. I also understand that some of us can have very complicated finances. That said I argue that for the many of us who aren't interested in personal finance and have simple financial affairs that they don't need much more than invest in ISA v, SIPP w and within those buy Vanguard LifeStrategy x. Now go and get a will that covers y. Surely that level of advice, followed by come back and see me in 'z0 years', could be offered for a few hundreds pounds given the repetitive nature of the advice. As you also say comments from people like your good self also keep me constantly thinking and have definitely helped me on my journey. I guess that's called a win win which makes this blog a worthwhile pursuit IMHO. Sounds good to me. I mentioned zero COST game for you - ie it is NOT zero cost to you because of the time you spend . I am not going to mention zero sum gain again for a few months ! Sorry meant NON zero sum game for me. Hopefully readers inferred that from my hobby and value in other non-financial ways comments. Your example definitely sounds non-standard and I'm sure there are many non-standard other examples. Maybe standard doesn't exist but I can for example imagine anybody who say has entered the workforce in say the last 15 or so years probably has a few non-consolidated workplace defined contribution pensions, maybe a S&S ISA but probably more likely a cash ISA, maybe some premium bonds, maybe some cash in a derisory interest savings account, maybe a mortgage, a credit card, some student debt and probably no will. I have no data to prove it so I'm very possibly way wide of the mark. Also complying with all the required regulations and the indemnity insurance required by law for the adviser are not cheap at all. You require this to even give the most simple advice and will add cost. I think where it breaks down though is there is no reason for the adviser to take a % fee. They should charge fixed amounts for the services they are providing. However very few customers like this structure and therefore end up paying significantly more. The term 'Active investing' is more commonly used more in the sense of selecting individual investments on one's own as opposed to buying a tracker where a passive tracker does the selection for you. Whether an IFA is involved is incidental. I consider myself an active investor and buy individual shares but I do not use any IFAs. The idea is that people like me are also on average doomed to lag the index because on average we are all part of the group comprising the market. Fortunately it is only an issue if "beating the market" is a goal. Some of us enjoy the process of investing in businesses and as long as the return meets our financial goals, all is well ! Passive " index tracker (IXT's)" funds have performed well since the financial crisis. Their low management costs have been a factor - but also they hold no cash so have remained fully invested throughout the current bull market - definitely the right strategy . The captalisation of these funds has also been growing so most IXT's have been net purchasers - ie more money buying than selling. The main drags on performance are fund management fees ( low ) and tracking error ( varies between funds ). All good so far. But NB - you still have to choose the right indices to track - and currencies play a big role here. In a bear market things will be different. Capitalisation of funds will tend to fall ( share prices weaken and more sellers than buyers ) . Funds will not only be selling to keep the portfolio in balance with the index they are tracking but will also be selling to pay out sellers of the fund . When companies fall out of the index - the fund has to sell ( selling low ) and the new entrants will need to be bought ( buying high ) even though the actual share price of these stocks may be falling ie they are performing relatively better but may be falling in absolute terms . I may be completely wrong - but the optimistic and bullish enthusiasm for passive IXT fund investing needs to be assessed over a full economic cycle or cycles and include bull and bear markets . Let's wait and see who are the really long term winners . @Stringvest In a falling equity market, automatically rebalancing trackers (e.g. LifeStrategy) will be buying equities to maintain their asset allocation ratios, so they will be buying low and also tending to support the price. but won't they be buying some of the companies that have fallen least - and selling more of the biggest fallers ? The worry must be that the forced selling of the biggest fallers will develop momentum - until such time as active managers /hedge funds etc see value in these companies ( even in a diving market ) and are prepared to start buying. The proportion of equities that are now held in index funds or IXT's or quant funds based on an index has never been higher - and the effect of automatic machine led selling at very high volumes has a yet to be confirmed effect. If they are market-capitalization-weighted (which is the conventional method), I would have thought that they would be buying overall (to keep up their equity allocation ratio), but buying less proportionately of the biggest fallers since the latter would account for a smaller share of the basket being purchased. There must be mechanisms to prevent costly overtrading: one method that comes to mind being to restrict the frequency of rebalancing. No doubt they are lot more sophisticated than that. Most indexes are cap. weighted so true index trackers are also. In US patterns of trading have changed so that the last 30- 45 mins of trading have seen significant increases in trading and enhanced volatilty of prices. A possible ( probable? )explanation of this increase in trading has been that it is due to index trackers ( and other passive funds ) trying to re-balance before markets close so they can end the day in line with the index. NB the index itself costs nothing to maintain as an index - but poses re-balancing issues on the trckers of that index . Funds differ in the leeway they allow themselves to keep in balance with the index. Know your index : naturally indexes ( indices ) differ in many ways .eg number of companies / exposure to earnings in different countries and currencies/ exposure to range of company capitalisations ( largest to smallest - huge range in indexes made up of large numbers eg Russell 3000)/ Section of market exposure eg tech/industrial/financial /utilty etc - these are all just examples of how indices differ. NB indexes like Dow Jones and Nikkei 225 are not capitation weighted- they are share price weighted. I'm lazy, I put money into LF Lindsell Train UK Equity. I did this because if I were picking large cap stocks, I'd go with s similar list. I am saying I'm lazy as I've not looked to see if there is a beta tracker that will replicate Nick's fund. I also have money in a couple of Investment Trusts and I am happy with them. I think thes also highlights something the active vrs passive debate misses. I am happy with my investment choices. Finally, I hold a small amount in a tracker: lifestrategy 100. I do this as a performance barometer. My portfolio beats this, but with higher volatility, which I am fine with.